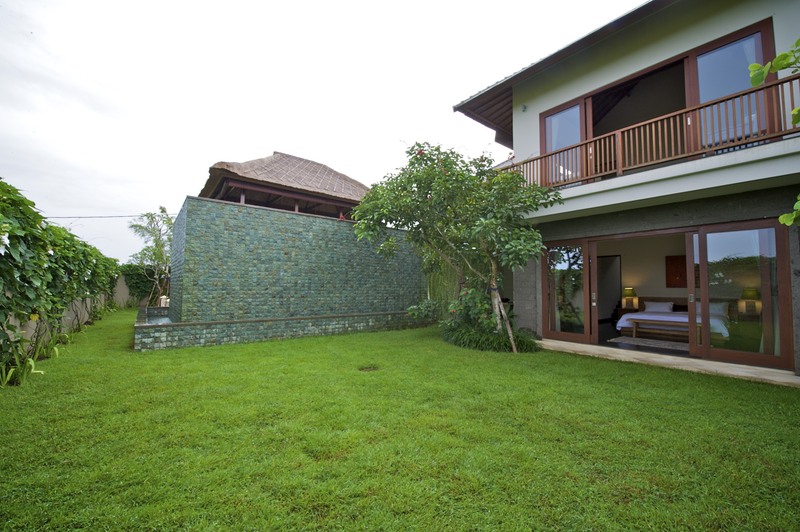 Villa Karang Bali consists of 4 bed rooms with attached bath rooms. It comes with quality materials and imported fittings throughout. One would be able to enjoy the ocean view when dining in the villa or Bale, or whilst having a relaxing swim in the 12 meters infinity edge pool. Alternatively, you can simply taking a scroll down at the white sandy beaches, with frequent sights of paragliding activities. - Daily car and driver for 8 hours per day, exclude petrol. Extra hour at extra charge $10/hour. High Season: June 23 - July 31, September 1 - 4, Chinese New Year and Easter Week. Peak Season: August 1 - 31 and December 22 - January 8. 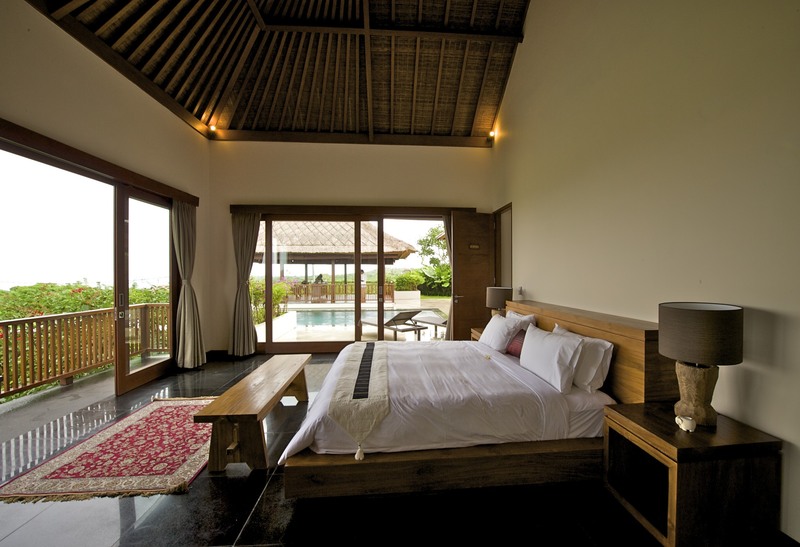 Minimum stay: LOW season: 3 nights, HIGH season: 5 nights, PEAK season: 7 nights. 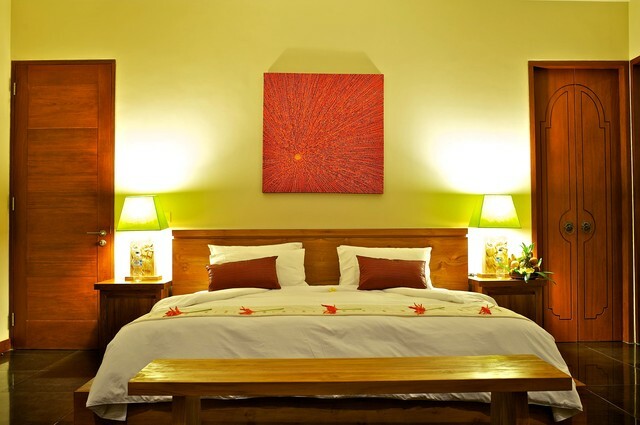 - Maximum occupancy is 2 persons per room. 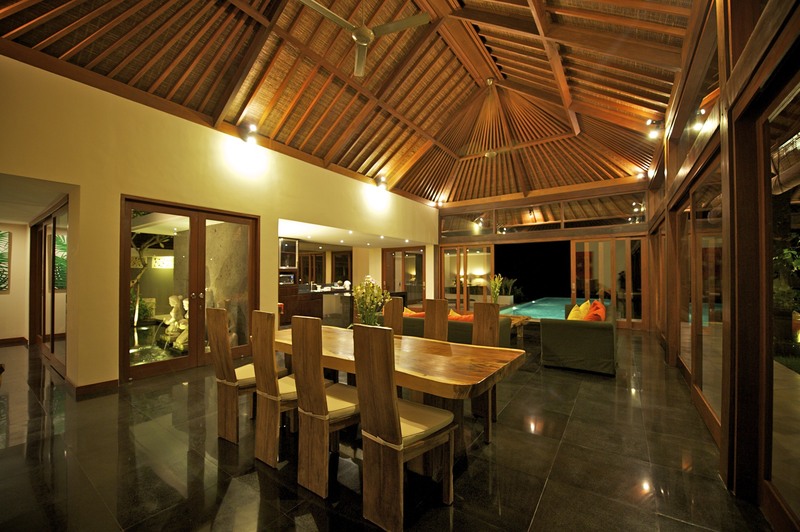 Villa Karang Bali is located in Bukit, south of Bali. 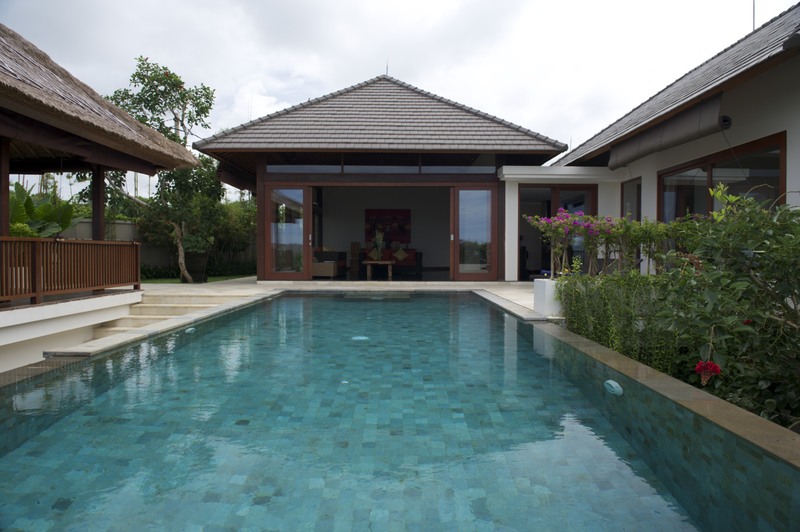 Designed by world renowned architect Popo Danes, Villa Karang Bali sits on a 9800 square feet plot of land, consisting of 7200 sq ft of livable space, filled with lush tropical Balinese landscape. 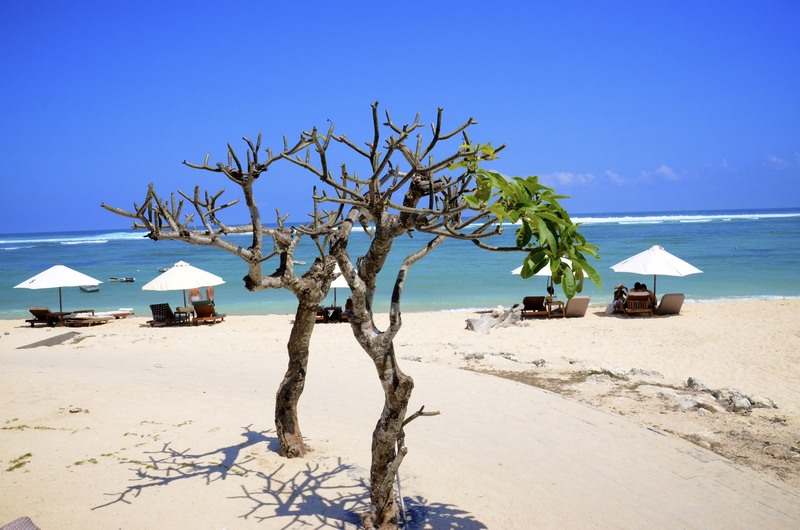 Overlooking Indian Ocean, it offers clear-blue waters as far as you can see that only ends at the horizon. 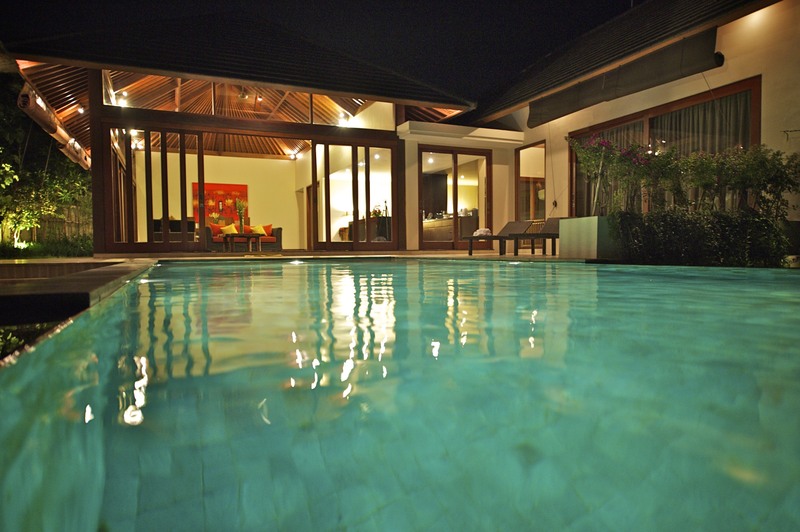 Its cool and fresh breeze from the south makes the living experience a truly memorable one. It is simply magnificent. Within a 30 minutes drive from the International airport, accessibility to all the restaurants and shopping areas is just a short distance away. 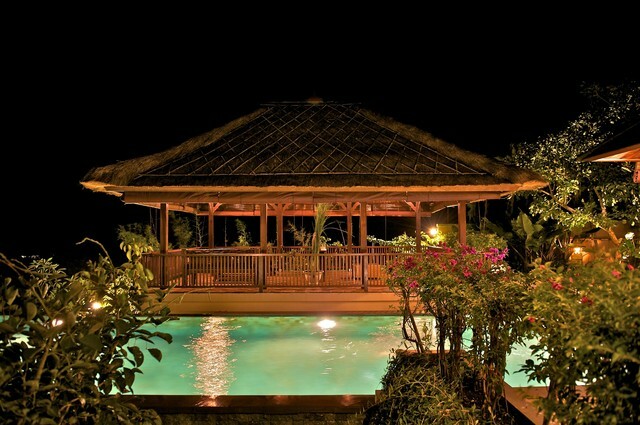 It is also surrounded by other resorts and spas such as Bvlgari Resorts, Banyan Tree, and Karma Kandara. 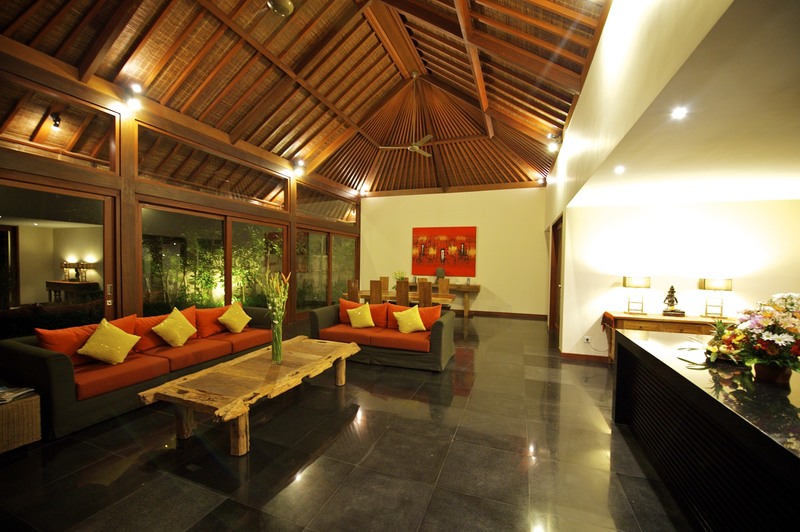 Villa Karang Bali is surely the perfect place to stay, and live. It blends all very well for those who want to have a truly memorable experience here in the island of Paradise, both leisure and pleasure. Main Floor Master Suite (Air-Conditioned). Main master suite is fitted with super king sized bed with comfortable bedding's, that will ensure a good and well rested night during your stay. Enjoying a full view of the Indian Ocean either while resting or at the balcony. 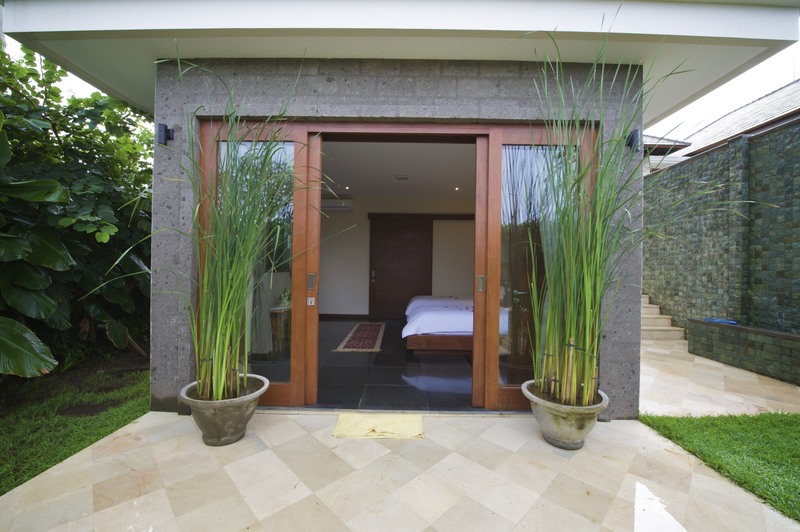 A choice of either indoor and outdoor shower or simply having a soak in the tub whilst enjoying the fresh air of the Bukit, are all available in Villa Karang Bali. Lower master suite comes with super king sized bed filled with huge fluffy pillows. 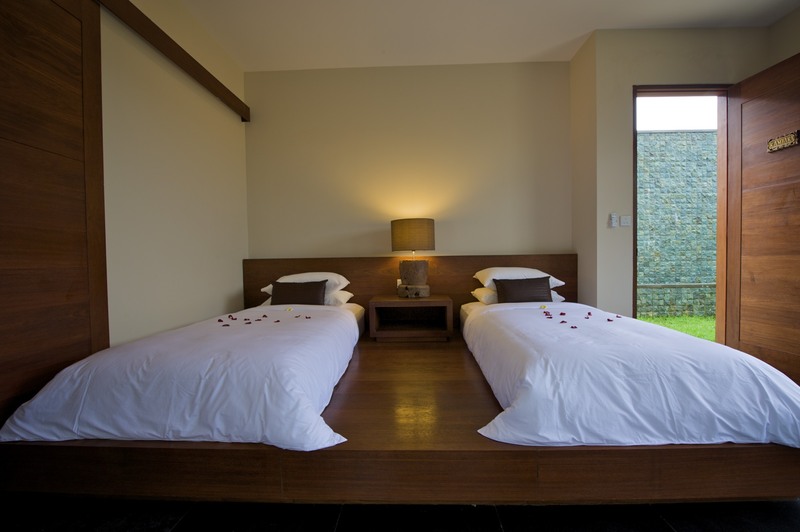 Whilst in bed, one will be able to enjoy the lush greeneries of the Balinese garden, together with the sound of water falling from the infinity edge pool. Or simply indulge yourself to a spa treatment, available upon request. This suite is completed with a king sized bed with attached bathroom. You can have relax in a nice patio by the veranda for an afternoon tea while just listening to the quietness of the nature and the sound of water. It's a well defined area to completely relax or read a book. This will be the only room that has the privilege of feeling afloat, while resting on the king sized bed, with attached bathroom. Enjoy the nice soothing effect from the sound of water splashing onto the pond with the Koi fish swimming within to relax your eyes. Generous living space together with a fully equipped indoor kitchen, constant cool breeze from the southern hemisphere with a complete view of the Indian Ocean. Wine and dine to the sumptuous meal that is personally prepared for you by our in house chef, or simply enjoy the view with a refreshing drink under the comfort of the Bale, by the pool. Media Room is the place where children or the family will be able to enjoy a wide selection's of movies and entertainment. Books and Magazines are also readily available, or enjoy surfing the internet on wireless network. 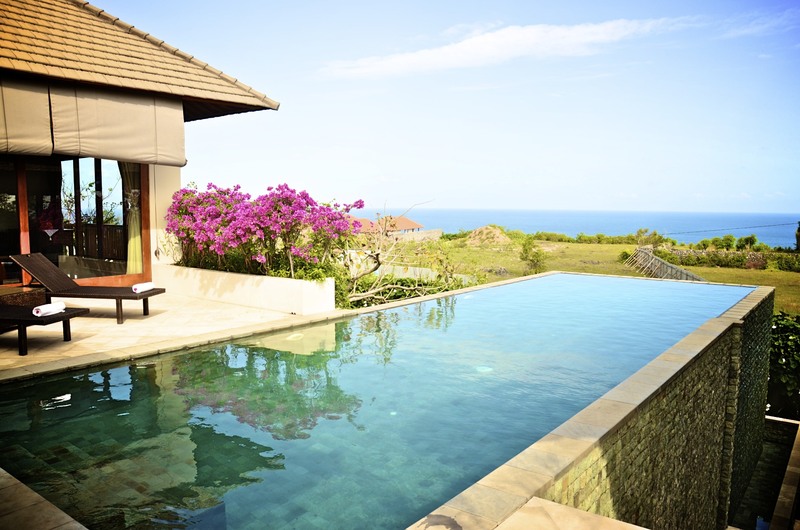 The Icon of Villa Karang Bali is a 12 meter infinity edge swimming pool, where water overflows the edge and flows down to the lower level, where one can enjoy a relaxing swim, with the view of the Indian Ocean. 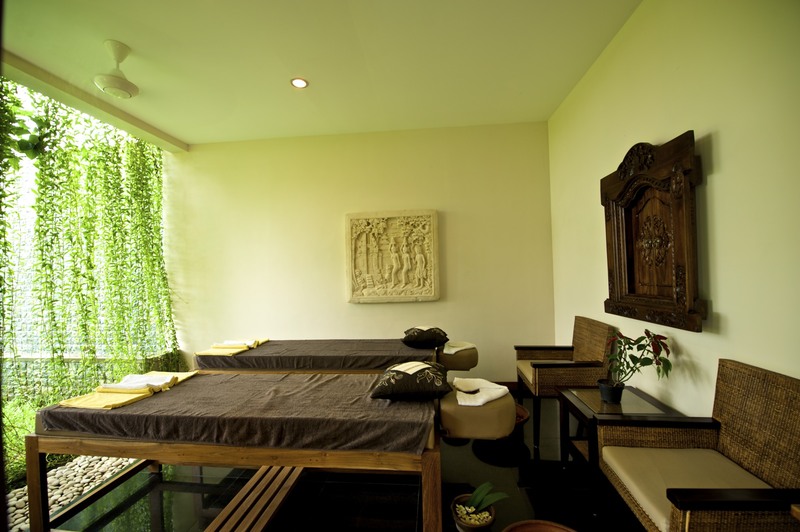 The traditional Balinese spa treatment by our trained masseurs will ensure that you are totally relaxed while you enjoy the serenity of the Balinese garden. With the constant breeze and the soothing sound of water, the treatment will ensure that you will be totally stressed free at the end of the therapy. Please note that for safety reasons, no smoking is allowed inside the villa.